I'll admit it. I don't get star-struck easily. In fact, I'm pretty uninterested in celebrity. What that means is that when I do interviews with people like Eddie Osterland, I don't always expect much. Of course, in Osterland's case, I should have known better. This guy really knows his stuff. Even better than that, although he has tasted some of the best wines in the world, and could probably recite oenophilic facts until the cows come home, he's down to earth and genuine. So, I did a preliminary read-through of his book, "Power Entertaining," which he generously gave me a copy of when we met. I have to be honest and say I didn't expect to be so interested in the material he was presenting. For one, it seemed as if he was pointing his advice primarily at business people and CEO's. And, frankly, I'm just a gal who loves food, wine and entertaining. But, Eddie is really just a guy who loves food, wine, and entertaining too. He's just capitalizing on that knowledge to give people an edge in a marketplace that doesn't necessarily automatically think to use those assets to win friends and influence people. And he does a really great job of it. The book contains an entire chapter dedicated to getting you up to snuff on the wines that will make or break your next dinner party. It has wine tasting tips. And a list of the best wines for home entertaining under $40. And it's filled with side-by-side pairing suggestions that will assist you in actually tasting the differences between key wines -- like French Burgundy versus California Pinot Noir, and Washington Merlot versus Washington Cabernet. Create a POWER COUPLE, a perfect food and wine pairing for your dinner: In charge of choosing the wine for your table or party? One of the easiest ways to make a wine and food seem like they have a natural affinity for one another is to use "mirroring" when you pair. Mirroring involves pairing two similar characteristics together to bring out that shared characteristic. If you have a peppery dish and want to emphasize the spicy pepper flavors, then pick a wine that has peppery characteristics like a Zinfandel. If you have an earthy, mushroom dish; and want to bring out that essence, pick an earthy wine like a Red Burgundy. It is no mistake that a rich, buttery California Chardonnay has a natural affinity for lobster; which is also rich and buttery. One of the easiest ways to guarantee mirroring in a pairing is to use the wine you are serving as an ingredient in the food as well. Be sure to buy enough for the number of guests tasting, and plan to provide eight 3-oz servings or six 4-oz servings per bottle. Never Save the Best for Last. Serve your best stuff first: Hosting a business party or dinner? According to renowned business author, Peter Drucker: "More business decisions occur over lunch and dinner than at any other time, yet no MBA courses are given on the subject". Most people will arrive coming from work, and perhaps after running around at the office all day. They're likely to be famished. People are so hungry when they first arrive that downing something small but unique makes a hugely positive impression. The French, who are masters of entertaining and the culinary arts, know this. So they give diners what is arguably the best thing they'll have all night at the beginning of the evening. It then sets the tone for the entire meal to come. You should do the same thing. So instead of offering them mixed nuts, pretzels, raw vegetables, and potato chips like everybody else does, serve them small sampler portions of foods like Scottish smoked salmon, foie gras, or, perhaps my favorite appetizer of all, jamón ibérico de bellota. 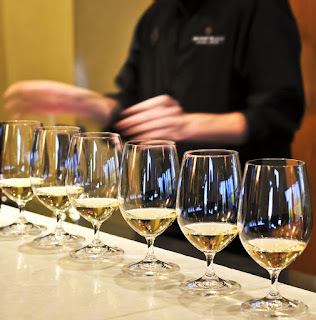 Your New Best Friend: The local sommelier or wine merchant: Really want to WOW your guests with a one-of-a-kind experience? THEME your event by enlisting the help of a local sommelier or wine merchant. You don't want to work with a liquor store or bottle shop owner. Talk to owners of local gourmet food shops or to the people who run the culinary arts programs in your community to point you in the right direction. Once you find a good resource, work with them to choose wines based on a theme that pairs well with food such as these theme ideas: The Bs of Italy: Barola, Barbera & Barbaresco, Dry German Food Wines, The Various Wine Regions of Spain…and more. I guarantee, this will keep your guests raving about your event long after the last glass is gone. Double Down: Hosting a large dinner party? Serve two wines simultaneously to be paired together with the first course. Why? It's not just educational it helps people mingle, breaks the ice, and injects a whole new social dimension into the evening that your guests can take back and then share with their friends and family. Examples: serve a Cabernet from France and a Cabernet from California so your guests can make observations on how geography influences style and taste of winemaking. Or order the same wine from two different vintages to demonstrate the significance of New World Versus Old World Comparisons. This is always a crowd pleaser! Warm Your Whites, Chill Your Reds: Yes, I know this runs counter to most people's thinking, but you want to guard against over-chilling your white wines and serving your red wines too warm. White wines are often served too cold, especially in the United States. However, a white wine's subtle aromatics (floral and fruity notes) are anesthetized at refrigerator temperatures. So take your white wines out of the refrigerator about 20 minutes before you want to serve them. Conversely, red wines often are not served chilled enough. Their "finish” can thus be a bit harsh, even caustic to the taste, if served at room temperature. To remove this edge, chill your red wines for about 20 minutes before you want to serve them to guests. This will give them the proper balance and fruit intensity when served. To help you maintain the proper temperatures of your wines, you may want to invest in a digital wine thermometer. The proper temperature for whites is about 50 degrees Fahrenheit and for reds, about 65 degrees Fahrenheit. "Power Entertaining" is worth every penny of its $21.95 cover price. 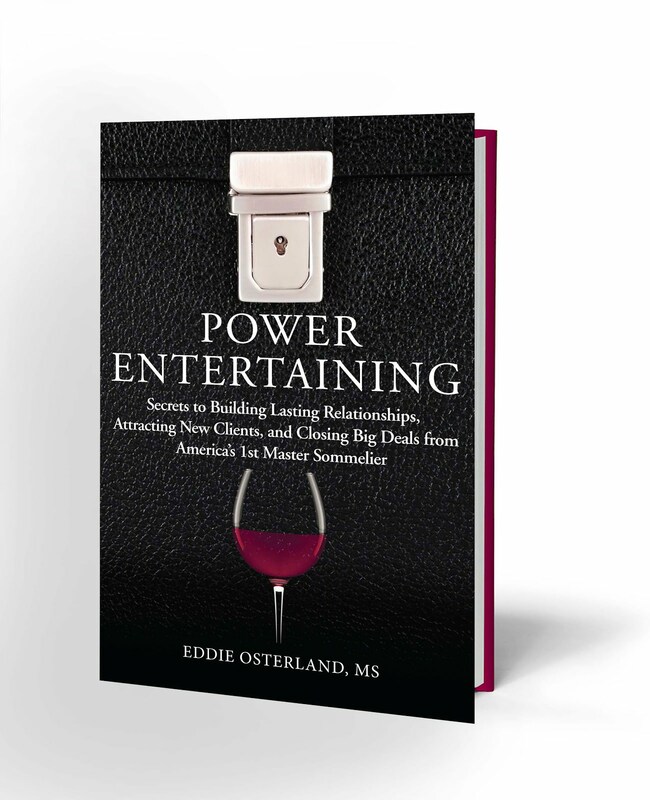 The book contains an absolute wealth of knowledge for anyone who wants to learn more about wine, throw an awesome party, or take their entertainment game to the next level. Even better, it contains enough wine pairings to keep you busy for the next... oh, forty years or so.